The List | What YA Reading? This is the story of eight girls, freshman to senior, “pretty” and “ugly.” And it’s also the story of how we see ourselves, and how other people see us, and the tangled connection of the two. The List features eight girls as main characters, half of whom have been deemed the prettiest in their grades by an unknowable but all-powerful source, and half of whom have been deemed the ugliest. The girls alternate as narrators throughout the week leading up to their homecoming dance, and during this short time we come to know their darkest secrets and their deepest fears. Some may say that opting to use eight different narrators is biting off more than any one author can chew, but not Siobhan Vivian. She’s just that kind of woman: bold, undaunted, and eschewing literary limitations and conventions like it’s nobody’s business. And I must say that she manages well. Although I did have to flip back to see who had taken the stage on numerous occasions, this didn’t bother me as much as it could have, and I appreciated every character’s distinctive point of view. Vivian approaches several teenage issues– eating disorders, bullying, identity, and objectification being but a few prime examples– and expounds on each of them in turn in her novel. The beauty of The List lies in her ability to illustrate these issues’ gravity without weighing her book down with their consequence. 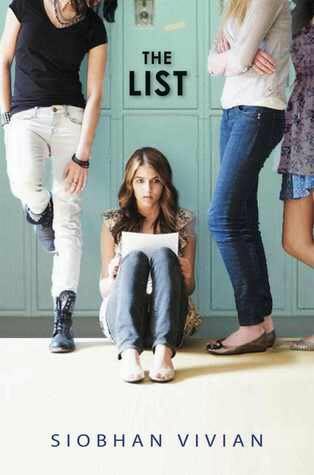 To the contrary, The List remains a light, easy read throughout the unfolding of its plot’s bleakest twists. This ability, to entertain and to inform at once, is of course a rare art. Which is why I am positively woebegone to inform you of The List‘s pitiful ending. (This is the part where you say: “What ending?”) To her readers’ utter dismay, Vivian stopped writing at the climax. Now, as she has written and published several novels since The List, I believe that we can safely assume that she did not do so due to a sudden and untimely death. And as gleeful as this makes me, I can’t say that it excuses her behaviour. Because, come on, what is so wrong with a good, old-fashioned epilogue? We’ve fallen in love with– or at least gotten to know beyond the social constraints governing the real world– eight characters here, Siobhan. Was it really too much to ask to see how they faired twelve months later? Actually, forget twelve months later; I would have been happy with twelve minutes later.. Why was that so hard? The List holds promise. It was engaging, entertaining, and charming enough to fully capture my attention from cover to cover. Unfortunately, its ending– or lack thereof– was enough to severely diminish said entertainment. For fans of high school dramas and all too clean breaks. 3.5/5 stars.